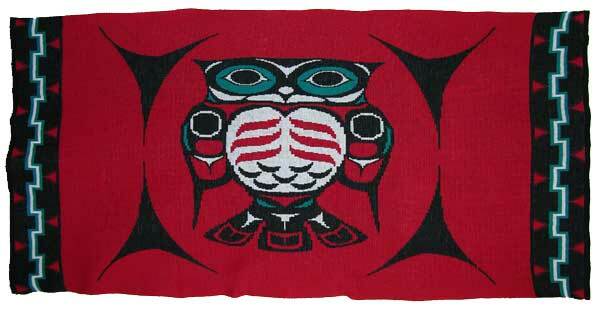 This Blanket is designed to honor the Owl of the Pacific Northwest Coast. You can find more various symbolic meanings on the web site of the owl. In many tribes the owl has a sinister meaning. In the Northwest, it was said that the owl calls out the names of men and women who will die soon. Among the Sioux, Hin-Han the owl guards the entrance to the Milky Way over which the souls of the dead must pass to reach the spirit land. Those who fail the owl's inspection because they do not have the proper tattoo on their wrists or elsewhere are thrown into the bottomless abyss. Do your own search and find out more about the owl depicted on this special blanket. Common features which are used in the "The Owl" are the black formline which defines all the parts. Inner designs of the head use the Ovoid for the eye orbit, cresents and trigons defining facial symbols. The Body is accented with S shapes to represent the ribs and black crescents to show feathers. The wings have split U, trigon, ovoid and cresents. The Tail Feathers also consists of split U, trigon, and crescents. The owl is encircled by 4 trigons with the inner curves forming on oval. The edges of the blanket are bordered by a geometric basket design. Submitted by Emailed in Review on Fri, 01/08/2016 - 13:03. My husband will take a photo in the next day or 2 and send it on to you. Please go to bed tonight knowing that you have made one 8 year old girl very happy. Thank you again. Your work is rare and precious in this increasingly de-personalized world. Submitted by Emailed in Review on Fri, 08/09/2013 - 21:31.